In this blog, David Moynihan highlights how people in temporary accommodation are not involved in decisions that affect their community and how they could be empowered to join in. By David Moynihan, Director of Projects, Social Life. Often the assumption when discussing communities and their level of power is that they are relatively settled and stable – that is, that people there have a long-term commitment to that place and therefore a stake in the decisions that affect it. This assumption can be incongruous with the increasing population churn we are witnessing in cities like London. This is a complex churn that can include both aspirational people on the look out for areas on the way up, to people on lower incomes in precarious housing being forced to move to neighbourhoods where homes are cheaper. A particularly powerless group within this are people who live in temporary accommodation. Temporary accommodation: a loss of community? People are placed in “temporary accommodation” by councils because it is part of their statutory responsibilities, usually their homelessness duties. Social Life’s recent work in many neighbourhoods going through regeneration has revealed an increase in the number of households being placed in temporary accommodation, as secure tenants move to new homes. For councils this is an efficient strategy, making good use of homes they own that otherwise would be lying empty, rather than paying higher rents for temporary housing in the private sector. Some councils are making imaginative use of their land in regeneration areas, Ealing Council is building temporary shipping container modular homes on the South Acton Estate. In 2016, London Councils conducted research with 16 boroughs to examine the use of temporary accommodation in London and found a 28% increase between 2014-15 and 2012-13. Nationally, recent government figures show a 60% increase in the numbers of households in temporary accommodation from 2011 to 2017. This marks the twenty-fourth time that the number of households in temporary accommodation has been higher than in the same quarter a year previously. This number is expected to swell further in the future. 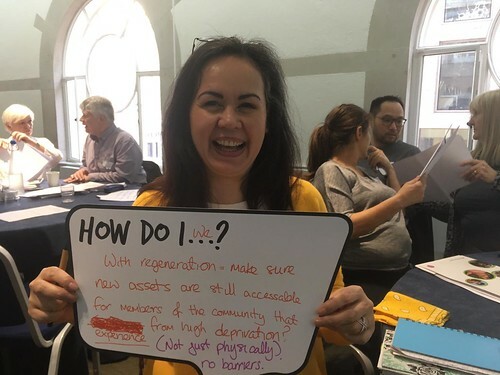 However, we are finding that people in temporary accommodation are often overlooked when it comes to engagement and consultation processes – about regeneration plans, new services, or community projects – and how their needs often do not feature within local audits that shape community investment programmes. Our recent work in Basildon, on the Craylands Estate and Beechwood Village, showed how an increase in temporary residents had brought with it additional (and new types of) socio-economic issues – impacting on both individuals and the wider community. The individuals and families directly affected often have high and complex needs, related to the reason why they are placed in temporary accommodation. They are a group that are likely to have lower than average incomes than most social housing tenants. These vulnerabilities can be exacerbated by having moving to a new neighbourhood often far from their networks of support. In London, 28% of the 78,180 households living in temporary accommodation in June 2017 had been relocated into another local authority area. Some temporary accommodation residents in Craylands had come from London’s outer boroughs including Newham and Waltham Forest. The move can separate people from family and friendship networks of support, from familiar services and third sector support and from work and employment opportunities. At the local level we have seen how these new populations can affect the dynamics of the area. In one London estate awaiting regeneration we saw how many active and vocal residents had moved away in advance of demolition, with people on temporary tenancies moving in. Some of these reported having fewer ties to their new neighbourhood and, knowing that their time there will be short-term, were less likely to lay down roots. We have also seen how longer term residents can voice resentments towards the incoming temporary residents, perceiving them (often unfairly) to be responsible for the area’s downward trajectory. We have spoken to residents who have described how their current home is their third temporary tenancy in a regeneration area, conversely, other residents live a long time in their temporary homes. One resident we spoke to described being a temporary tenant on a north London estate for 13 years. Because people in temporary accommodation have fewer legal rights, housing providers and councils often feel less of a duty to involve or engage them in consultations, service planning or community activities. While temporary accommodation is not a new thing, the placement of temporary tenants by councils in estates that are being cleared of secure tenants before demolition is a new phenomenon. The concentration of people with high needs in areas that are experiencing the dislocation of regeneration and often impending demolition is creating new and unacknowledged issues. On these estates a section of the community is emerging that is relatively powerless, and that has little control over their future options. People in temporary accommodation are rarely seen as having a stake in the long term future of the area. Our thinking about urban areas needs to acknowledge churn and transience, and to acknowledge that place-making affects all those living in an area, not just those who have statutory protection through their tenancies or property ownership. This perhaps comes back to the dilemma of “identity or place”, which IVAR highlighted in its interim report. As with other things we used to consider stable, such as a permanent, long lasting job could it also become true that a long lasting ‘community of place’ could become a luxury only afforded to some?